With all due respect to Art Spiegelman and his decades worth of revolutionary comics storytelling, his JACK AND THE BOX is only my second favorite Toon Books title. STINKY is number one with a bullet. And it just happens to be newcomer Eleanor Davis' first published kids comic. 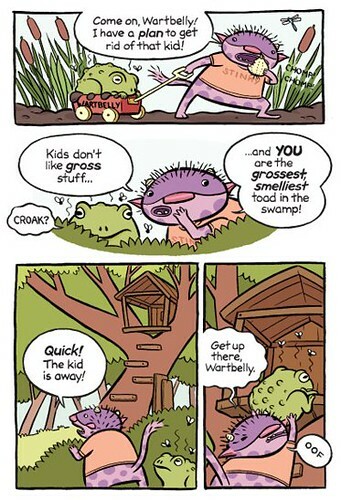 Hanging in the forest, noshing his pickled onions and happily shooting the breeze with his warty toad; Stinky is the coolest little monster in town. But when he sees a tree house being built (on his favorite tree, no less!) the poor little freak is beside his purple self. He spots the terrifying intruder- a young boy whistling happily as he strolls barefoot through the woods. The suburbs are encroaching on Stinky's home! But he's got a few tricks up his sleeve to scare this kid off, starting with putting his prized pet toad into the tree house. Unfortunately this is just the first ploy that backfires. The kid loves the toad and adopts him immediately. And so it goes until Stinky learns that he and this kid have a lot in common and just might be better off as friends. As I said, this is Davis' first published comic book and she nails it. So much so that she's nominated for an Eisner Award this year. The narrative is flawless, the images pop with color and personality and the story is completely charming. It's far too easy to make this kind of material pretentious or cutesy. But Davis' story is heartfelt. The humor is never forced, it comes organically from the character. She makes Stinky the kind of dude any kid would want to hang and eat pickled onions with. Check out STINKY at Toon Books HERE.